One of the most elusive creatures is leopard. 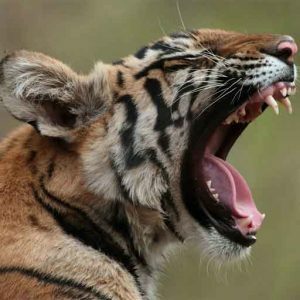 Making their existence highly imperceptible, these big cats are living in and alongside the forests, protected areas, villages and also suburbs of big cities like Mumbai and Chennai. * They have leaned to coexist with humans as quite a population is seen living inconspicuously nearby small villages and buffer zones. One such pair of these elusive beautiful big cats was spotted right in the buffer zone of Satpura National Park near a small village called Kamti. A night safari into these areas would put forth sightings of sloth bears, sambar deer, bule-bull, owls, hares, even wolves, wild dogs and Indian striped hyenas at times. Nonetheless, leopards! This mating pair was crossing a small naalah when spotted in the light of gypsy. They were moving on after having mated probably a very short while ago. At first, the pair was baffled and they sunk into the bushy scrubs quickly. A few minutes later the male leopard came out and lied down boldly in the open followed by the female. The lady was shy and definitely not sure about being in the open. She straightaway went into the thicket nearby and settled down. What we got to see after this was something really amazing and rare. After almost ten-fifteen minutes she decided to move towards her partner who was relaxing in the moonlight. She came towards him and gently passed across softly brushing his nose with her tail. This certainly woke him up and he found her coming to him again and brushing herself softly against him. This repeated two or three times and she sat in front of him for a while. But with no response from his side, she walked back to the thicket and lied down. This behavior pattern was repeated twice after that. The pair did not mate and we made a move leaving them alone. 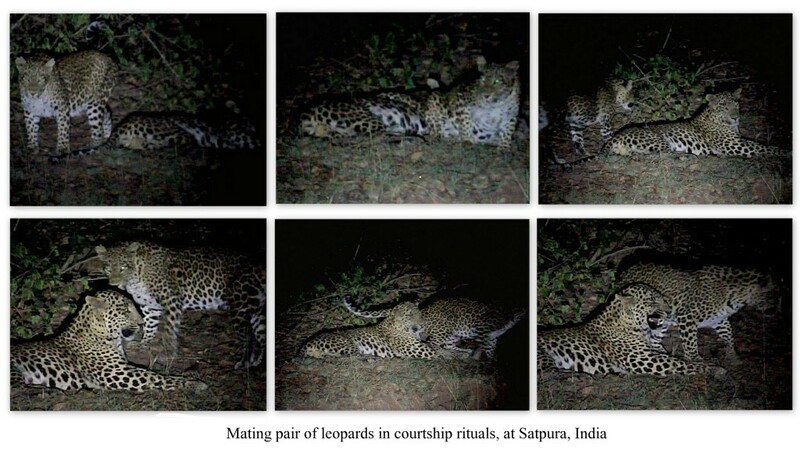 What we witnessed was courtship behavior in leopards which is hardly seen live. Given that leopards are very discreet about their presence, they are highly so during the mating period. We could hardly believe in our luck that we got to see a very rare moment in the nature. Not with perfect clarity given the low light, Kshitij managed to capture the courtship sequence. Sharing it with you with great joy! Posted on May 20, 2014 by pugdundee blog. This entry was posted in Animals, Wildlife and tagged denwa backwater escape, leopard, leopard at satpura, leopard behavior, leopards mating, pugdundee safaris, satpura national park, wildlife. Bookmark the permalink.